Yarn Recorder (2018), So Kanno, Ebru Kurbak. Interactive object. Wood, stainless steel, electronics, sound. Developed as a continuation of the “Magnetic Recording on Fibers” workshop (2014) carried out by So Kanno, Ebru Kurbak, and Irene Posch with the engineering assistance of Matthias Mold. The “spindle” is one of the oldest technologies on earth, even older than the wheel. It is undoubtedly the archetype of all rotating things that have been invented since then: car wheels, geared machines, tape recorders, CD players, propellers, and countless other technologies. From prehistoric ages up until the Industrial Revolution, spinning yarn for weaving cloth in the home was among the most important necessities of life. With the mechanization of textile-making processes, hand spinning has lost its position as a necessity, at least in Europe, and has become a process for manufacturing luxury goods if not a hobby. 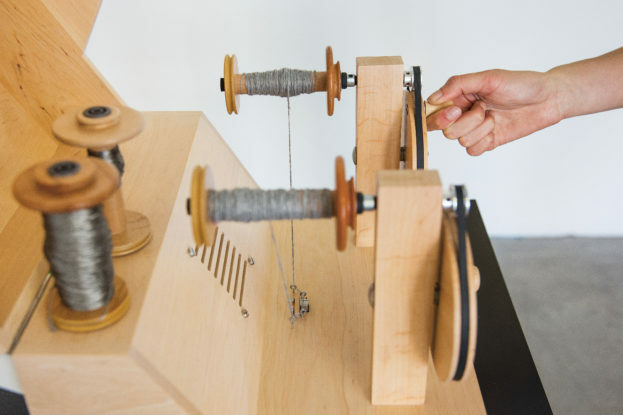 As a result, the societal value given to the process of hand spinning has drastically changed, as far to make it hard for us to conceive the influence of the simple spindle on the development of the complex and sophisticated technologies of today. 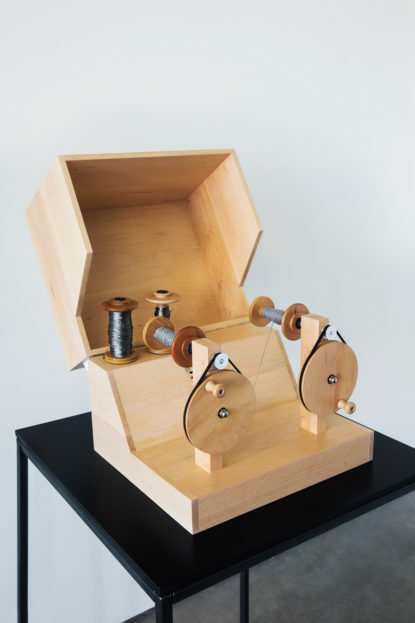 The Yarn Recorder intends to reveal this fascinating link through playful interaction, as a commentary on the changeability of the value of things.